Elder Clark has officially been serving for nine months!! Christopher is currently serving in a place called Rangel, which by the way when he says it, sounds nothing like you are thinking. 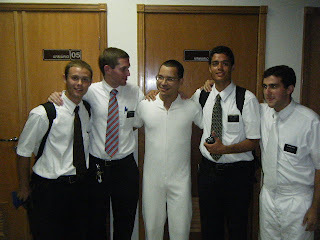 He is serving with his 5th companion Elder L. Gomes and doing very good. On Mother's Day we were able to talk to Chris and it was awesome!! It is just good to get to hear his voice and to hear him tell us that he is doing and feeling good. He also asked us about what they call in Brazil, the "cold of the pig". It only took us a few minutes to realize he was actually talking about the "swine flu". He says that everyone there thinks that all Americans have it! He felt much better knowing that not all of us have it. On Sunday they were able to baptize Karlos. 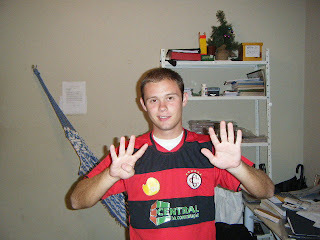 We are very happy that Chris is staying positive and finding happiness in his service in Brazil. We know that he is going to have many more wonderful experiences in the coming months. We love him, we miss him and we are already looking forward to(do i dare say it)....Christmas so that we can talk to him again!! WHAT THE HECK@???? are you serious? 9 MONTHS??? ?